In the wake of Europe's so-called refugee crisis in 2015 and 2016, even traditionally open countries such as Sweden and Germany adopted hostile policies on refugees, closing borders and linking refugees with terrorism and threats to national security. Once deemed taboo, uncharitable conduct towards those in need has become increasingly acceptable, and even desirable, throughout the Western world. From Righteousness to Far Right follows nineteen months of ethnographic fieldwork with a grassroots NGO in a small Swedish village, where over one hundred refugees were housed. Through an embedded, anthropological study of day-to-day life in refugee resettlement, Emma Mc Cluskey examines how increasingly antagonistic and xenophobic policies concerning refugees gained legitimacy. Arguing that existing approaches to critical security studies inadequately address the textured, contradictory, and often resistant practices of everyday life within societies, Mc Cluskey re-gears securitization theory along anthropological lines and shifts the focus of the investigation onto the quotidian realm, where much of the controversy over migration and security plays out. 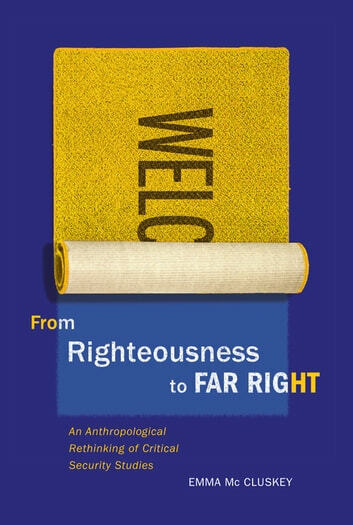 A provocative and original political statement on today's increasingly conservative society, From Righteousness to Far Right presents an astounding new perspective on the recent refugee crises and the acceptance and normalization of far-right and securitarian politics.